This page is archived as of 3/18/07. It is no longer updated. Please contact us about renting this advertising space. Premium Pet Food Delivery Service was founded to help dog and cat owner's provide their pets with a high quality, nutritional diet without the worry or hassle of running out of food. Why Should I Feed My Pets "Premium" Pet Foods? According to Tufts University School of Veterinary Medicine, "premium" dog foods actually cost less than so-called "economy" brands. The reason is that the higher-priced dog food is so densely packed with nutrients you can feed your dog less of it. Introducing the "Raw Meat Diet"
Nutritionally balanced & complete in vitamin, mineral, fat, carbohydrate & protein content including a balanced calcium/phosphorous ratio (using fresh ground bone) NO Supplements needed! 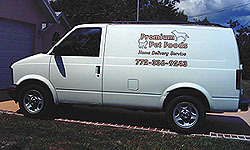 We offer a little bit of every kind of quality pet food - delivered. For those pet owners on a budget to those who wish to pamper or spoil their pet! Disclaimer: We are not licensed veterinary professionals. Our dietary recommendations are only in regards to the skin, coat, weight, activity level and age of your pet. If your pet should show any signs of illness or unusual behavior, always check with your veterinarian first.